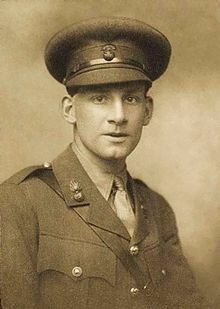 Few days ago an article in The Guardian announced that drafts of poems by Siegfried Sassoon, among them also that of Atrocities, one of his most famous anti-war poems, then collected in Counter-Attack, have surfaced during two manuscript auctions. Great interest rose around this discovery that seems to disclose new critical approaches on the genesis of Sassoon’s poems (and as a consequence on his complex attitude towards war) and, at the same time, seems to offer even new unpublished materials. As soon as these fragments will be available, we should be able to evaluate their importance and also to take position pro or contra the different critical analyses. At the moment, we see in this discovery the “occasion” to re-read Sassoon, one of the leading poets of the First World War, who needs therefore no presentation. We choose Sick Leave, among the ones of Counter Attack (1918). The poem was written in October 1917, during Sassoon’s stay at Craiglockhart War Hospital, where he was trying to recover from a supposed shell-shock. Originally entitled Death’s Brotherhood and sent by letter to Lady Morrell, Sick Leave gives a proof of the personal method enacted by Sassoon to conciliate the protest waged against the war and the sense of personal responsibility. And it was indeed a hard conciliation that described in this poem, which places its impossibility between the initial image of comfort sleep and the “unfriended” awake of the last verses. In the middle, the perceiving of “the noiseless dead”, of the ghosts of the dead men from the battlefield “from Ypres to Frise”, the battlefield where Sassoon also fought and saw them dying. In the “bitter safety”, those ghosts mirror the conflict within the author’s consciousness: he cannot bring those who he saw fallen back to life, he can maybe accept once again command over those still living, whom he had left behind through his gesture of protest after the death of his friend David Cuthbert Thomas, namely his renowned Soldier’s Declaration. We know that Sassoon returned short after to his soldiers in France and fought the last months of WWI. But maybe – almost for sure – his decision doesn’t mean an untroubled answer to the last verse of this poem; and could the blood of dead and living men ever find peaceful conciliation? On the contrary, the final question reveals how painful and complex was the struggle he was fighting to really put an end to his interior “sick leave”, which has to last till long after the end of the Great War. Out of the gloom they gather about my bed. They whisper to my heart; their thoughts are mine. “Why are you here with all your watches ended? I think of the Battalion in the mud. “When are you going out to them again?